Khufu’s full name was Khnum-Khufwy, which means ‘[the god] Khnum protect me’. He was the son of Sneferu and Queen Hetepheres I, and is believed to have had three wives. He is famous for building the Great Pyramid at Giza, one of the seven wonders of the world, but apart from this, we know very little about him. His only surviving statue is, ironically, the smallest piece of Egyptian royal sculpture ever discovered: a 7.5 cm (3 inch) high ivory statue found at Abydos. Khufu came to the throne, probably during his twenties, and at once began work on his pyramid. The entire project took about 23 years to complete, during which time 2,300,000 building blocks, weighing an average of 2.5 tons each, were moved. His nephew Hemiunu was appointed head of construction for the Great Pyramid. 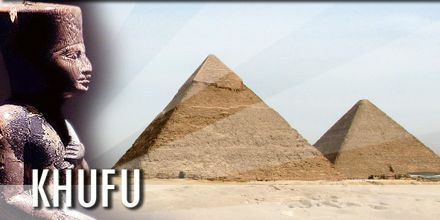 Khufu was the first pharaoh to build a pyramid at Giza. The sheer scale of this monument stands as testament to his skills in commanding the material and human resources of his country. It is now believed the pyramids were built using conscripted labour rather than slaves. The idea that Khufu used slaves to build the pyramid comes from Greek historian Herodotus. He also describes Khufu as a cruel and wicked leader who prostituted his daughter when he ran short of money. But the Westcar Papyrus describes Khufu as a traditional oriental monarch: good-natured, amiable to his inferiors and interested in the nature of human existence and magic. Although King Sneferu was remembered as a benevolent and beneficent ruler, Khufu is believed by some to have been a more ruthless and cruel despot. He was rumored in later times to have been prone to enjoying the fantastic stories of the reigns of his predecessors, as well as tales of magic and the mystical. His fame lasted throughout Egyptian history and he still had a funerary cult as late as the Saite Dynasty (26th Dynasty). Of course, whether or not he was a cruel ruler, he did command a tremendous ability to organize and mobilize worker. There was an extremely large amount of manpower necessary to build the Great pyramid and its surrounding complex and tombs. Certainly Khufu would have had the benefit of witnessing the previous pyramid projects of his father, Sneferu. The Great Pyramid stands witness to the ability of Khufu to lead and coordinate his people. Current theories espouse that the building of the Great Pyramid was not achieved by slave labor. Instead, the project defrayed taxes, which were paid in the form of goods and services as there was no monetary system. Also, due to the annual inundation of the Nile there was always a yearly segment of the population that had some time that they could not spend in their homes. Curiously, although his father was probably buried in Dahshur, Khufu chose the Giza plateau to situate his pyramid, temples, and perhaps, his tomb. Also curiously, he did not choose the highest spot on the plateau, which was later used by his son and successor, Khafre. This gave Khafre’s pyramid the illusion of being taller, when in fact the Great Pyramid is the actually the taller pyramid. Khufu had several sons and his immediate successor was his son Djedefre (Radjedef). Curiously, Djedefre also chose to build his pyramid at a location other than that of his fathers. Instead Djedefre was buried to the north at a site now known as Abu Roash. A remaining son of Khufu – Khafre, was to join his father building his pyramid at the higher spot in on the Giza plateau. Although Khufu’s pyramid is actually bigger than Khafre’s, the higher ground provides the illusion that Khafre’s pyramid is taller. After the death of Khafre, his son Menkaure built his smaller pyramid at Giza, eventually completing the last of the famous pyramids at Giza. Khufu of Egypt died of an unknown cause. It is generally agreed that his reign began in about 2589 B.C. and lasted until 2566 B.C. Because few records from that time survive, limited details about Khufu are known. He told the building of his magnificent tomb, the Great Pyramid at Giza (Necropolis near the modern Cairo). The Pyramid comprises of about 2.4 million rocks, with individual stones averaging about 2 and a half tons each, carried up to 500 miles to the work point. Construction is thought to have taken about 20 years, with a workforce figured as high as 300,000, all supervised by Khufu’s nephew, Hemiunu, who may have been the Pyramid’s designer. It is unsure whether these workers were slaves, as there is some prove that at least some of them taken a nominal pay. At its closing Khufu’s great Pyramid was the greatest man-made building on Earth, every side evaluating more than 75,000 feet in distance. It is the last of the basic Seven Wonders of the World still resisting. The internal chamber where Khufu was buried has been discovered and explored by archaeologists, but his rests have never been determined.